The United States' moral standing in Asia has been questioned since the end of World War II. The U.S. changed from China's major ally in fighting Japanese fascists to China's top enemy in less than five years. On the other hand, in less than ten years after the U.S. dropped an atom bomb on Japan, Japan became one of U.S.' allies. Such transformations can be attributed to American realism and pragmatism against the shifting background of the post-war world. But does all this conflict with the idealist slogans the U.S. has been chanting all over the world, such as justice and human rights? In many protracted grievances and conflicts in Asia, and indeed the whole world, there have been different degrees of American influence. Take the Sino-Japanese dispute over the Diaoyu Islands for example. The Cairo Declaration clearly states that all the territories Japan has taken from China shall be restored to China. The Potsdam Declaration further stipulates that "Japanese sovereignty shall be limited to the islands of Honshu, Hokkaido, Kyushu, Shikoku and such minor islands as we determine." However, in 1972, the United States bypassed China, who was a contracting party of both documents, and, slighting China's protest, single-handedly traded the Diaoyu Islands with Japan in return for military and geopolitical assurances. China did not take further action to protect its sovereignty, partly because it was weak and chaotic at the time and partly because of the greater picture of normalizing relations with both Japan and America. However, China and Japan managed to shelve the dispute and agreed to concentrate on developing good-neighborly relations that would benefit both peoples. However, emboldened by America's so-called "return to Asia" policy in recent years, the Japanese conservatives have become increasingly aggressive in challenging the post-war international order. They have basically dismissed the neighboring countries' protests about Japan's militarist past or the issues of comfort women and the Yasukuni Shrine. On the other hand, they keep strengthening Japan's military muscles and are seeking a fundamental change in the role of its Self-Defense Forces. 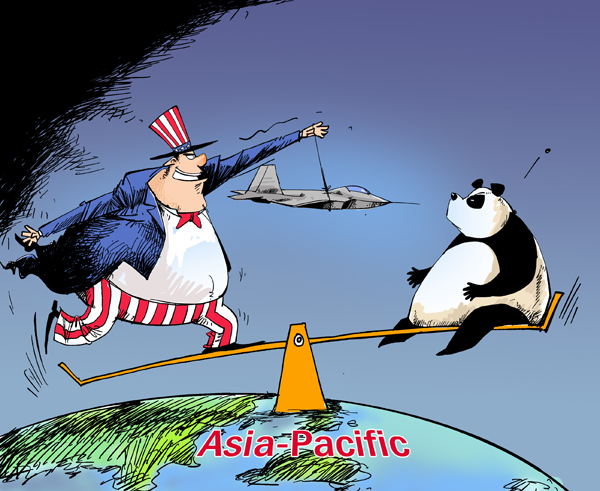 On the political level, Mr Abe's so-called "pacifism" and the American "rebalancing" have staged a most disturbing duet for China, which fears that its security and core interests are threatened. Against such a backdrop, Japan's so-called nationalization of the Diaoyu Islands was the last straw in breaking the tacit agreement between the two countries. The U.S. has played a most regrettable role in this regard. While always claiming to be neutral, it has consoled and armed Japan but criticized and isolated China. A major recent incident has to do with China's declaration of an "Air Defense Identification Zone" (ADIZ) in the East China Sea. As a major country in the region, China is entitled to demarcate its own ADIZ for better protection of its homeland security. However, neither Japan nor the U.S. has shown respect for China's legitimate rights. Japan unilaterally declared that China's ADIZ is illegal and forcefully stopped its airline companies from submitting their aviation data. Soon after, the United States voiced its concern and expressed that it would not recognize it either. Even Australia chimed in, from the southern hemisphere. More than twenty countries and regions in the world have ADIZs. America does, and so does Japan, so why can't China? China wants its own share of international security and what is wrong with that? We have changed but America has not. Japan is the fire and the United States has long been supplying the fuel. It is time for the U.S. to reexamine its moral standing in East Asia.